Now that we know we are in the midst of a flu epidemic, it is important to be aware of the risk of pneumonia. The flu virus is the most common cause of viral pneumonia in adults and many people can develop pneumonia as their weakened immune systems are fighting flu. This particular pneumonia can be severe and sometimes fatal and is most serious in people who have pre-existing heart or lung disease, or in women who are pregnant. The viral pneumonia that can develop from the flu virus is only one of dozens of kinds of pneumonia, however. There are many causes of pneumonia, both from viruses and bacteria, as well as from mycoplasma (small, free-living agents) and fungi. According to the CDC, nearly one million people a year nationwide are hospitalized with pneumonia, which can lead to respiratory failure, sepsis and lung abscess. About 500,000 people die from pneumonia each year. Many deaths are preventable through vaccination, awareness, healthy behaviors, and early treatment. Getting your vaccinations is extremely important. First of all, the annual flu vaccination is a primary defense for all ages. It also is important for everyone 65 years or older to get a pneumococcal vaccination against Streptococcus pneumonia, the most common type of bacterial pneumonia in adults. Those with weakened immune systems or who have chronic illnesses also should have this vaccination. Other vaccines are available, so please discuss you individual situation with your physician. Practicing a healthy lifestyle also can help prevent pneumonia. Health conscious behaviors include washing your hands often, getting enough rest and exercise, not smoking and eating a healthy diet. Also, people with flu or respiratory infections should stay away from others. Still, there are many different causes of pneumonia and unfortunately it can easily develop in people with chronic health issues. Pneumonia is an infection in one or both of your lungs. It causes inflammation and can lead to the alveoli (air sacs) in the lungs filling up with fluid. This in turn makes it difficult for oxygen to reach the blood stream. Symptoms include: fever, chills, wheezing, cough and difficulty breathing, rapid breathing, pain in the chest, and a general feeling of weakness and ill health. Their severity and symptoms do vary depending upon whether the pneumonia is caused by a bacteria or a virus. The important thing is to seek medical care immediately when pneumonia is suspected. While anyone can get pneumonia, some people are at a higher risk than others. They include: those who smoke or who have chronic lung disease such as COPD, bronchiectasis or cystic fibrosis; people who have difficulty swallowing because of Parkinson’s disease, dementia, stroke, or other neurological problems; those with chronic diseases; those who have compromised immune systems or those who have recently had surgery or experienced a serious trauma. Treatment of pneumonia depends on what type it is, how serious it is, and the patient’s general health. Many people can stay home and drink plenty of fluids and get lots of rest and recover in a few weeks. They also need to follow their doctor’s advice, especially involving the use of cough medicines, which often can make the situation worse. If the pneumonia is caused by bacteria, patients often will receive antibiotic therapy. Do not give aspirin to children. For severely ill patients who have to be hospitalized, treatment usually includes intravenous antibiotics, fluids and other medications, as well as breathing treatments and even oxygen therapy. Recovery often can be slow. Patients should follow the advice of their physician and get adequate rest and care. With so much illness in our midst, it is important to take care of ourselves. If you or your children are sick, please stay home and avoid being around others, especially friends and family who you know are either older or who have chronic health issues. 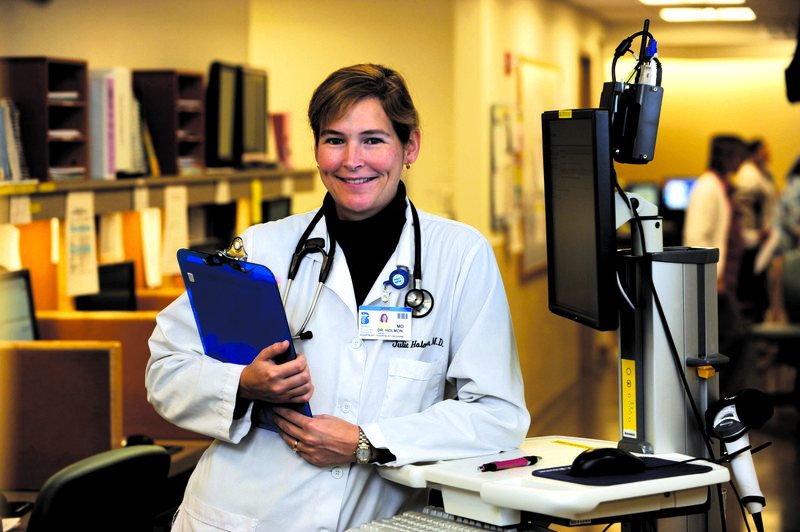 Julie Holmon, MD, is Medical Director of the Hospital Medicine Program at Beebe Healthcare. She is Board Certified in both Internal Medicine and Pediatrics. She earned her medical degree at Johns Hopkins University School of Medicine, Baltimore, Md. Dr. Holmon’s residency in Internal Medicine/Pediatrics was completed at Christiana Care Health Systems in Newark, Del.